I’m not going to address the elephant in the room (that being my delinquency in updating my website.). Okay, I will but only to say — Honestly, I just can’t keep up. “But you’ve had an entire year,” I hear you say. Yes, I did. And the year passed in a blur. What can I say after I say, I just can’t keep up. Wouldn’t you rather I be writing my books? Which brings me to two things that are close to my heart, the first of which is my new book, DRIFTWOOD POINT, which releases on June 21 (that would be this year, 2016 — in case, you know, it’s another year before I get back to business here). This is my second chance at love story, one of my favorite themes, because who doesn’t love second chances? Lis Parker broke Alec Jansen’s heart when he made the mistake of asking her to the junior prom in front of a whole big group of people — and she said no. No explanation. Just...no. It was a moment he never lived down. You’d think he’d have written the girl off forever, right? Sometimes it’s not that easy to let go of a dream. When Lis comes back to Cannonball Island after years away pursuing her art career, she’s surprised to find Alec still around. And by around, I mean around the general store owned by her hundred year old great-grandmother, Ruby Carter, who Alec has been looking out for since both Lis and her brother Owen have been scarce these last few years. With Lis’s paintings on exhibit in the St. Dennis Art Center, she has time to spend with Ruby, listening to the stories passed down through her family and falling in love with unspoiled Cannonball Island again. Don’t you wonder how she’ll take it when she finds out that Alec — now an environmental consultant — is working with a developer to build new houses on her beloved island? And that Ruby — her Gigi — is on Alec’s side of the argument? I mentioned two things that are close to my heart, didn’t I? The second thing? I’m working on an all new women’s fiction series to be published in trade paperback — the first book of which will be out next spring (that would be 2017). The series is loosely based on something that occurred in my own family that’s still a bit of a scandal, and it’s this: When my mother was in her forties, she discovered that her father had a separate family living in another state. She never let on to my grandmother, and actually did not share the story with her siblings until after my grandmother passed away. There’s still a mystery that surrounds that story — half siblings she tried to contact who basically told her to go away and forget she ever heard of them (she actually met her half-sister once but that’s another story entirely). Anyway, my series, which we’re calling the Hudson Sisters, is about three women who find out they are related at a most awkward time — the reading of their father’s will. Because he died feeling guilty at having never told any of them the truth (like the fact that he married the second wife while wife number one was still alive), he changed his will to require them to complete a challenge before they can inherit his very sizable estate. The challenge? Restore an art deco theater that had been built by his grandfather in his hometown of Hidden Falls, in the Pocono Mountains of Pennsylvania. The first book, Last Chance Matinee, finds Cara, Allie and Des reluctantly complying, and arriving in Hidden Falls to take on the challenge, each for their own reasons. I am absolutely loving writing this book, and I hope you’ll look for it next year (and we’ll hope I remember to remind you!). 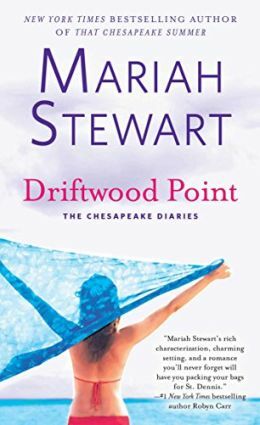 In the meantime, you have DRIFTWOOD POINT — the tenth book in the Chesapeake Diaries — on tap just in time for your July 4th weekend. Perfect for reading by the pool or on the beach, or in case of rain, curled up in a comfy chair. I think you’ll love Lis and Alec and the story of how, at long last, they found each other on Cannonball Island.